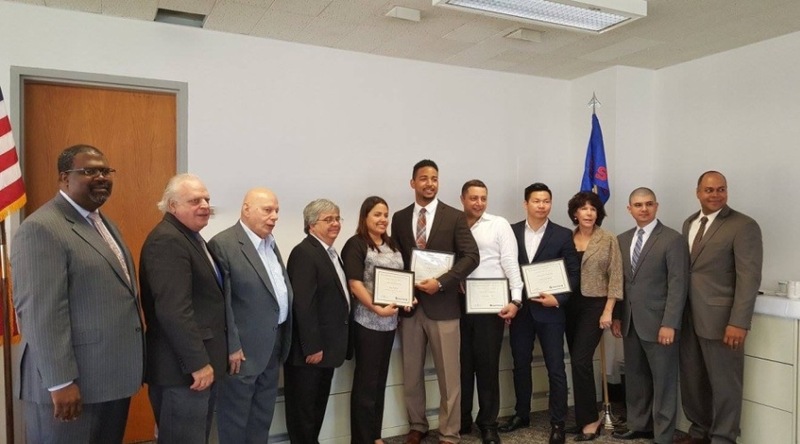 The Office of Military and Veterans Services in conjuction with the newly formed Friends of Veterans New York Organization awarded scholarships to four graduating QCC Student Veterans. On hand to congratulate these outstanding individuals (L-R) QCC Vice President, Student Affairs and Enrollment Management Mr. Michel A. Hodge; Mr. Joseph Dubowski- Friends of Veterans New York; Mr. Carl Joseph Gianatiempo - Friends of Veterans New York; Mr. Paul A. Nappi - Friends Of Veterans New York; Ms. Ana Zarate - Award Recipient; Mr. Derek Floyd - Award Recipient; Mr. Hooman Arya - Award Recipient; Mr. Lianghua Jiang - Award Ricipient; QCC President Dr. Diane B. Call; Mr. Edwin Gonzalez - QCC Director of the Office of Military and Veterans Services and Dr. Brian Kerr Assistant Dean of Student Development, Student Affairs. I would like to congratulate Ana, Derek, Hoomam and Lianghua, they are without a doubt very deserving of this award. A very special thanks to Mr. Gianatiempo, Mr. Nappi and Mr. Dubowski from the Friends of Veterans New York, without their support this ceremony would not have been possible.